the eyes had it, until the talons did. tiny bits of lizard left on toes? 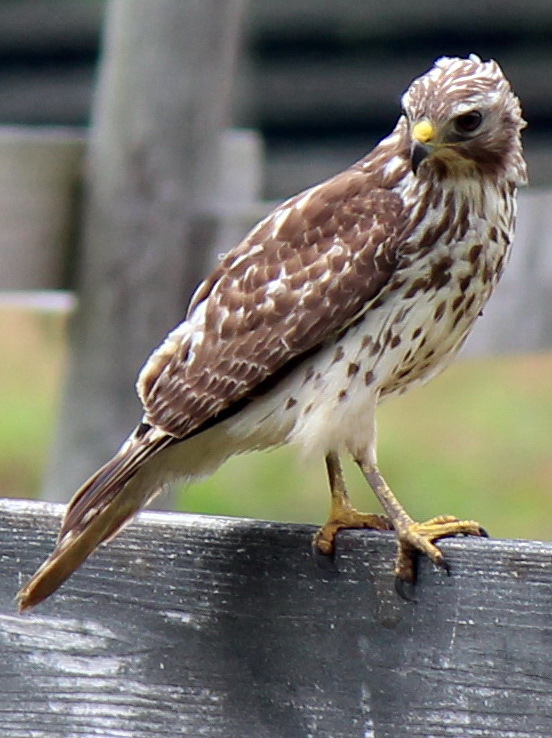 Juvenile Red-shouldered Hawk, checking out snack options. Jangly, shimmery summer 90’s music has been on the playlist (thank you dj husband) and doors are open in the studio. Yard fires, bird song, and that awesome musky blooming plant smell keep luring us outside. The tufty back pasture behind our place is a fabulous hunting ground for birds. 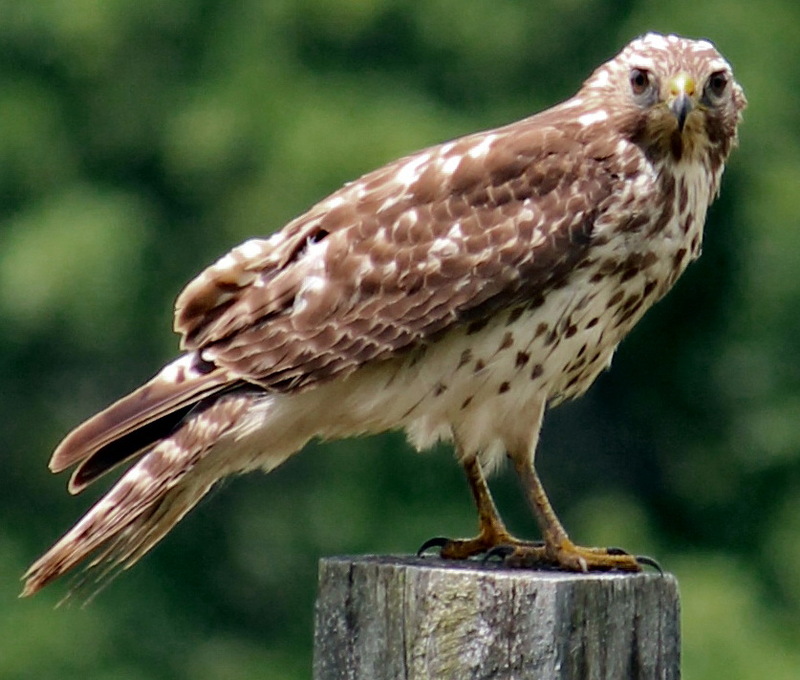 Poo- and viscera-splattered fence posts are testimony to its attraction, in particular to Red-shouldered Hawks. Snakes, anoles, and little hairy unidentifiable things seem to be the primary prey. happy confluence and source of post title, listening to Silver Jews / David Berman, and walking out to see this. 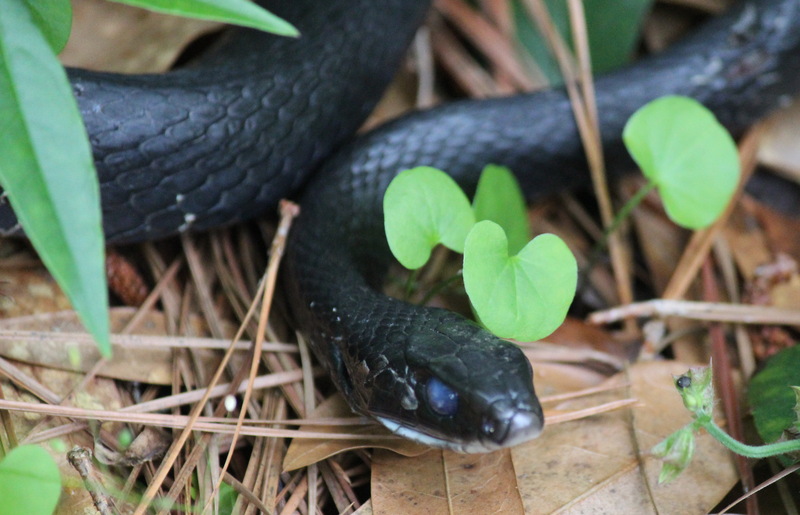 Black Racer, and Dichondra carolinensis. and the other side. hope this little one makes it. Black Racers prefer the brushy perimeters. This one was cruising the edge of the yard with its head held up like a periscope. Usually these snakes scoot away when approached, but this individual had a cloudy eye and some scarring along its sides, so perhaps flight mode is compromised. Maybe a run-in with a weed-wacker or lawn mower? 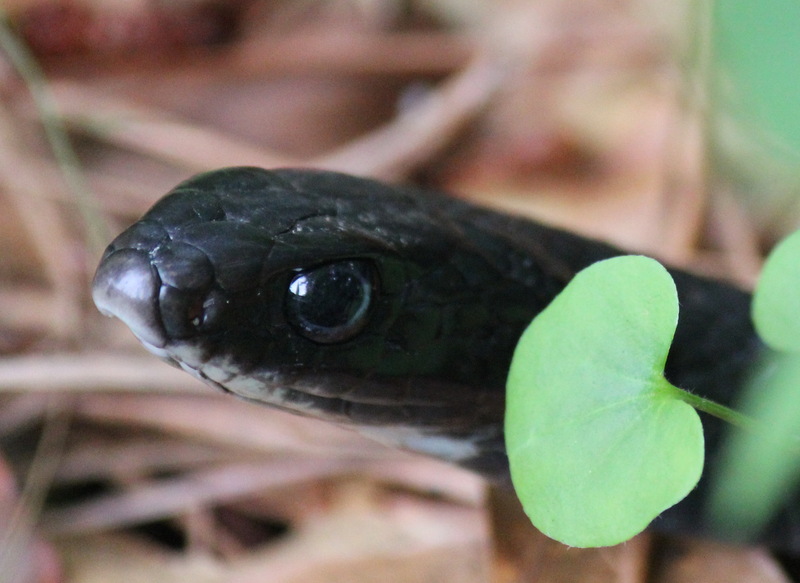 Black racers have excellent vision and hunt by sight. It watched the camera with its good and gorgeous eye, and rattled its tail when the lens got too close. A star is born. 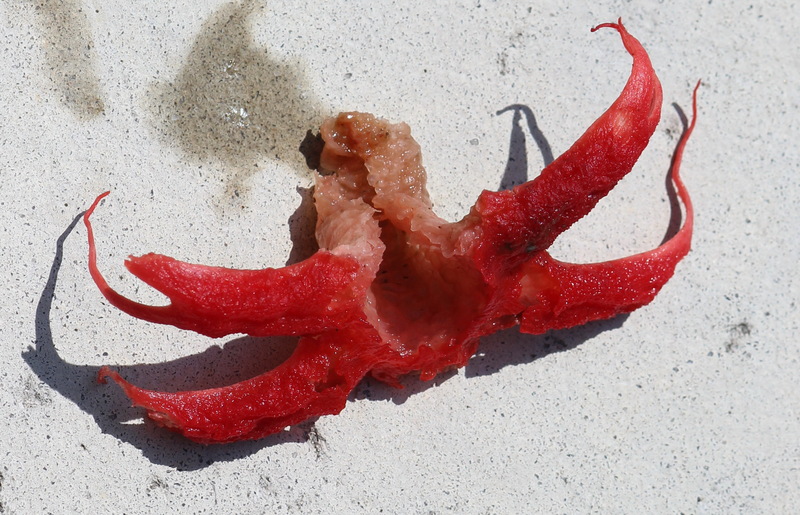 A Starfish Stinkhorn, Aseroe rubra – removed from its egg-like structure under the leaves. What a dumb play on words. 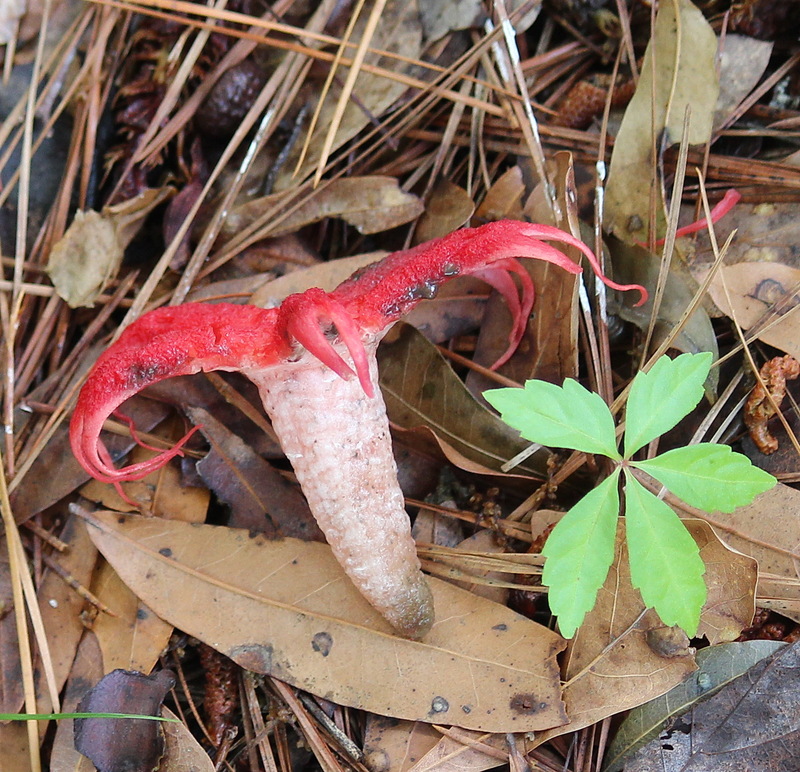 But really, we had fun, we saw galls, and some were caused by fungus. It’s true! Last week, an EF1 tornado blew through the neighborhood. It was a scary novelty exaggerated just a teeny bit by excitable local news media and booze-addled neighbors. Hail and huge raindrops pelted the ground before and after, so the ground was saturated – perfect conditions for some weird stuff to appear. fleshy underbelly of stinky starfish. and a closer view on concrete. Be thankful for no scratch and sniff option. 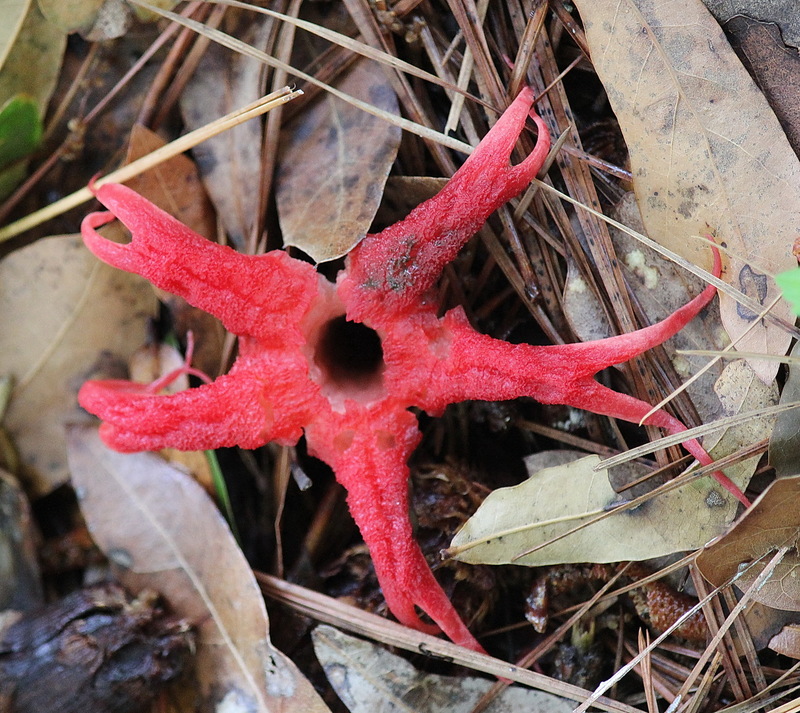 Starfish Stinkhorns, Aseroe rubra, have worldwide distribution, but are apparently not common in North Carolina, and may have been introduced. We’ve never seen them, so it was treated like an alien landing – we pointed, poked, prodded, and smelled. (Indeed, they are stinky.) Thank you Mushroom Expert for identification! Exobasidium vaccinii, perhaps? 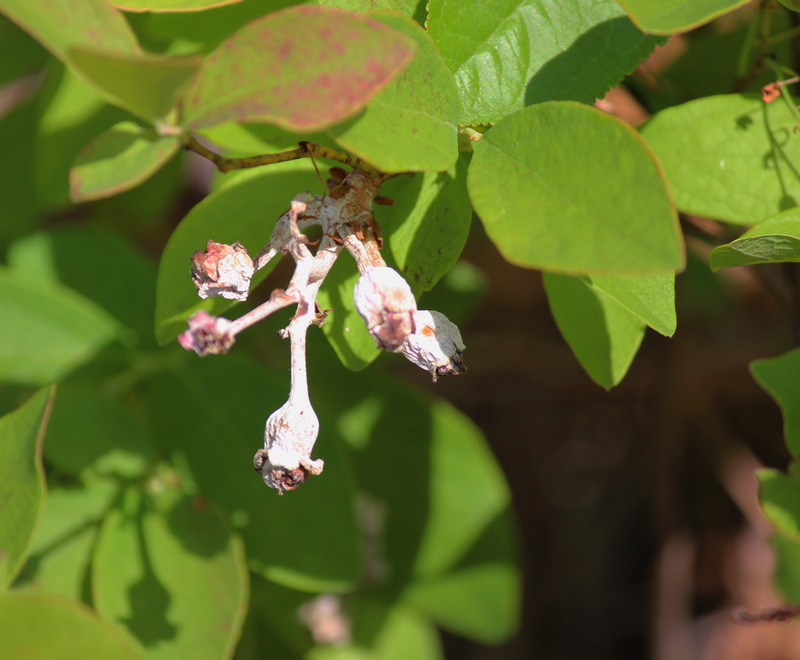 This flower gall is at least twice the size of typical flowers, shadow visible upper right. Broad-headed Skink, about 7.5 inches long. 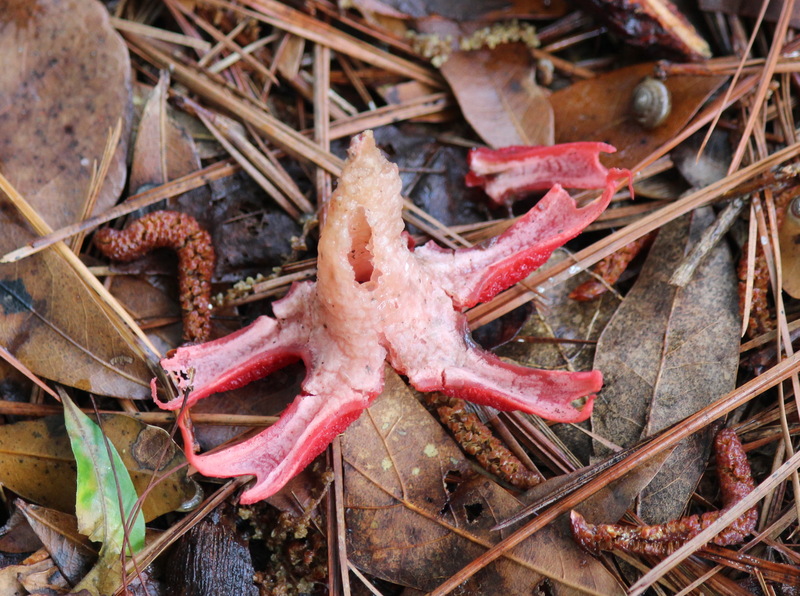 During our wanderings, some scaly life forms also made an appearance in the damp maritime forest floor. 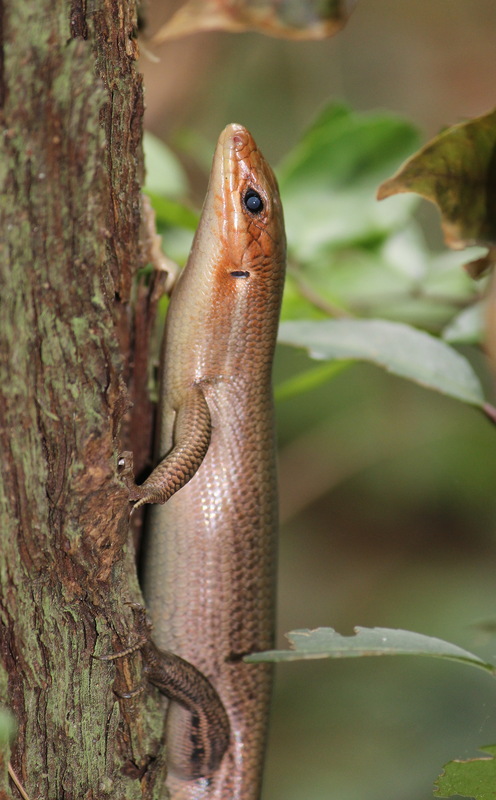 A Broad-headed Skink scuttled up a tree to avoid getting squashed, making a racket worthy of a much larger scarier creature. 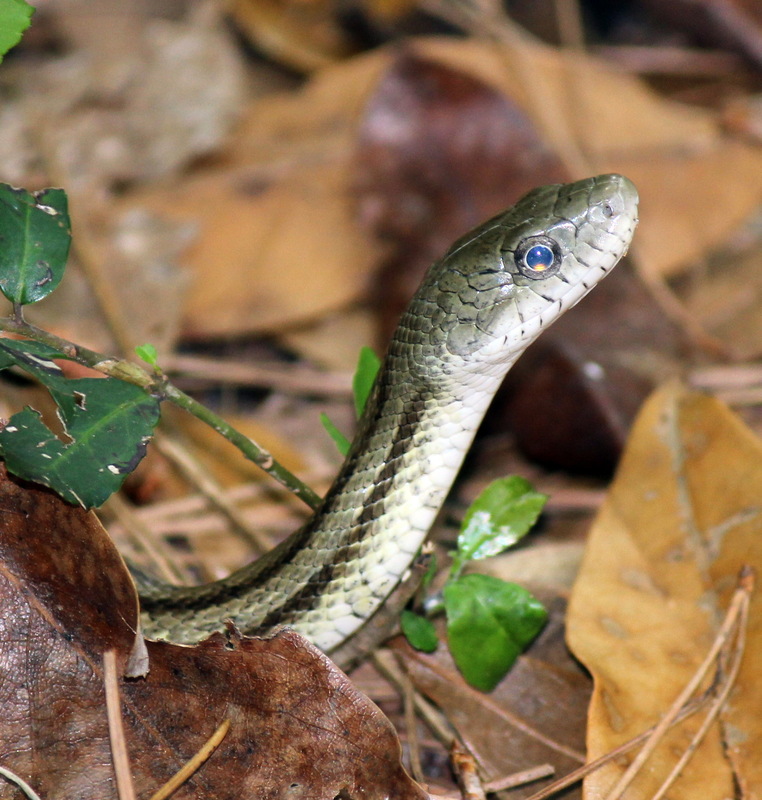 And this little Yellow Rat Snake eyeballed us from the path edge, braving some close-up observation without flinching or bolting.